Even though we had a busy weekend with two of our girls participating in a large soccer tournament, I found a little time to do some garage and tag sales... I was very happy with what I found!! I absolutely loooove this desk! 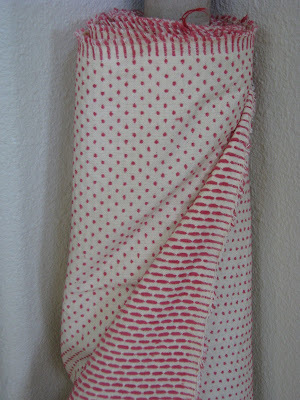 I bought this darling fabric from my friend Cindy, I have great plans for it! 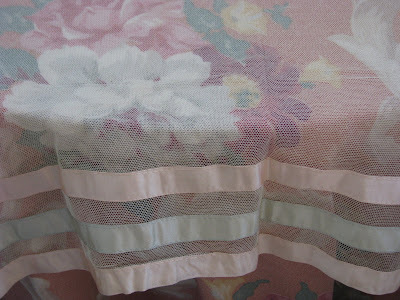 This darling sheer table cover, along with some of the items below, came from the twins Diana and Donna, who were having a tag sale this weekend at Cindy's barn! 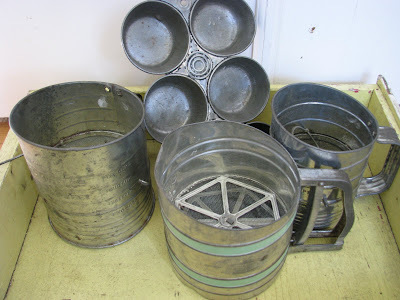 I found the next items at Monticello on some of my latest visits... 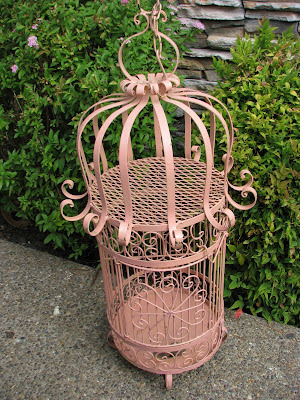 I am absolutely in love with this pink birdcage!!! ... And I couldn't resist this old cement religious statue! The last find I am sharing was found at Expo in the parking lot! 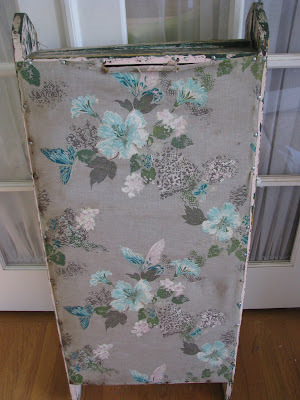 An old fabric covered sewing stand that cost me a whopping $5!!! I love the inside, and am really toying with the idea of keeping this one and recovering the outside with a fabric more of my liking!! You have found some great treasures, as usual, you have a great eye for it. 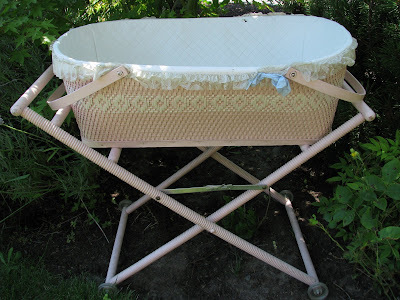 I love all the fabric and the curler bonnet I still have mine. 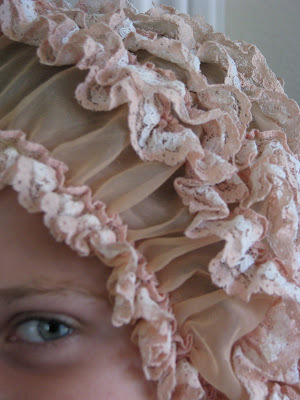 It is really old, I remember wearing it over the curlers on a Saturday morning going to town, because I wanted my hair to be curly for my hot date that night. Yikes. That was in the sixties. People did go to town like that, can you believe that? That was in Hood River, Oregon. I love all the things you found just so very nice & can't wait to see how you change them...lovely. Have a blessed hump day! You found some great things! My favorites...the birdcage, the desk, the bench, and the vintage nightcap. You are the queen of vintage finds!! 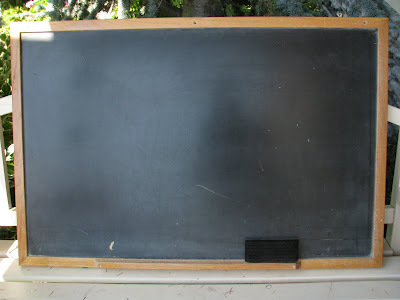 I love visiting your page to see what things you have found! Have a great one! 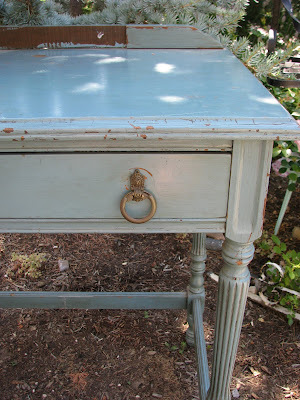 Love the sewing stand/chest. Never seen anything like it! So I hear you & I won the contest of getting sunburned at the BH Flea. I think I passed you up by a little stretch :o))) My nose still looks like "Rudolph"
That statue is 2die4! I love the red paint on it. Your sewing piece should have your name on it. 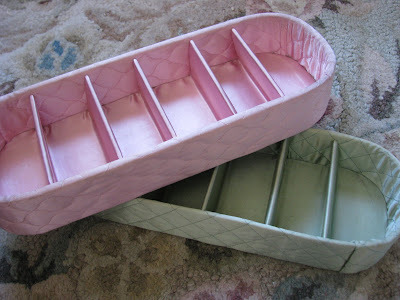 What a wonderful to store supplies that you could just move from room to room with you or show to show for tags, etc.! Keep it!!! 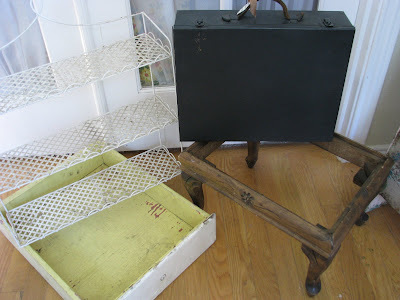 Lovely finds, all of them, but that sewing stand is a real eye-opener! I was musing today on just what kind of container I would need for my threads to stop them rolling themselves into a nasty knot at the bottom of the basket, and there it is! I had no idea such things existed. I wonder if I could improvise something similar..? WOW...SCORE !!! Your new treasures are amazing!! Very very good! 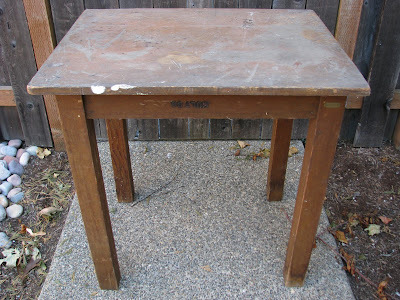 You have a great eye... the sewing stand is cool! Oooo...I LOOOOVE that blue desk (my favorite color). You shopping diva! I am starting a NEW Mr. Linky party. It will begin on Aug 10th so everyone will have a week and a half to think about their first post. I have a poll up for votes on which button should be the new button. The "party" is called The Knock Off Knock Out-where THRIFTY meets creative sensation. Go over and learn more about the new weekly event and I would appreciate if you would cast your vote and HELP pick the new button design and its the last week for the July GIVE-A-Way, if you would like to be a part of that event..
Oh Isabel, I love your little sewing chest! I've never seen anything like that...I would have totally passed out in the parking lot! Great find...everything was!!! 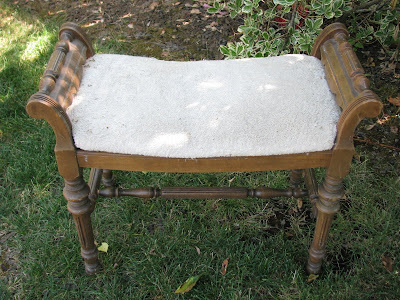 treasures galore, hope to see you at the flea market saturday. Isabel, that's a LOT of great stuff! You must work really fast. That blue desk is my favourite! Isabel--I used to have a pink hair net EXACTLY like the one pictured . . . actually slept on BRUSH curlers!! Ah, what price beauty?! those are some grand finds... i don't know what i like best.. but i do love that desk... and your statuary... and... and... so glad i don't have to choose just one! Oh!!! Look at that desk! It's fabulous! 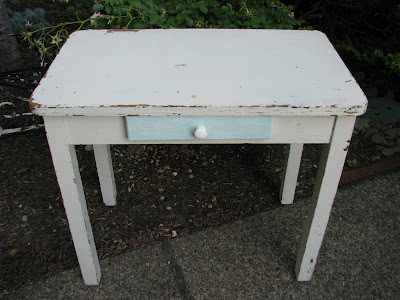 And the sewing stand is just wonderful! What great finds! You do so well in finding the neatest things ever. Yep I very fond of the bird cage as well..
you lucky girl...I absolutety adore the desk and the suitcase(?) at the end is also a treasure!! Your house must be a dream!! what great finds! 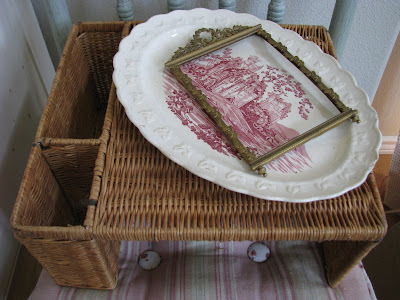 !I especially love the basket! I am schocked LOL these are so just sooooo wow, I love that stuff en your daughter looks marvelous with the pink head ! I'm so sorry I missed this one...your presentation of your "gear" is so fabulous! 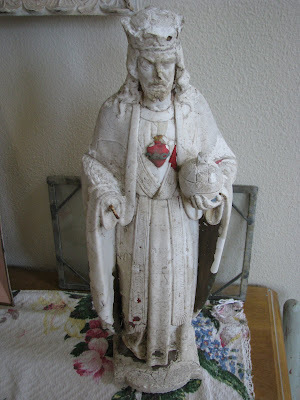 Just out of curiosity is your wonderful cement religious statue for sale or was that a keeper? Fun! Have you sold that religious statue yet? If so, that's probably good (for me)... if not, can you email me and tell me how much it is? I love it! I so enjoy and appreciate your comments!! Thank you so much for stopping by!!! My name is Isabel Feist Lang, and I am so happy you stopped by!! I was born and raised in Lisbon, Portugal, but one day I met my prince charming in his dress blues and now call Oregon home. I am a wife, mother of four and incurable collector!! I especially love pink roses and my favorite color is... pink!! 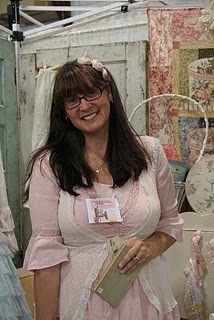 My fondness for all things vintage has led me to a little venture selling at antique malls and shows! Thank you for visiting! This is a Flickr badge showing public photos and videos from Maison Douce. Make your own badge here. 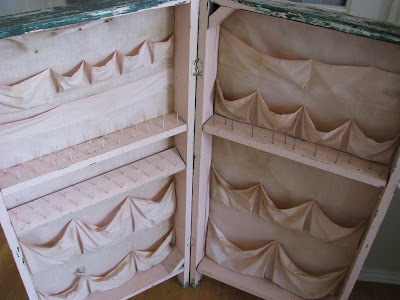 Fabric dresser tutorial and cool finds! Would you be my guest? The heart and soul of Paris. 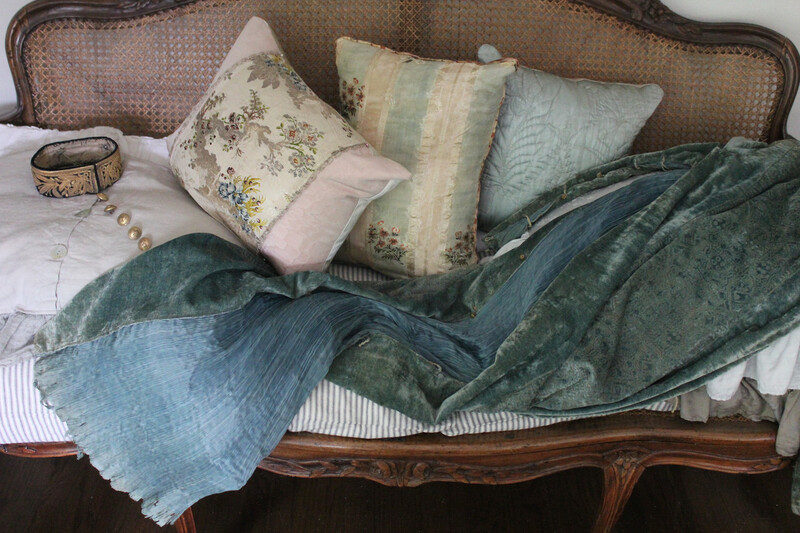 Cloth Queen Anne Doll ~ "C"
Charlottes Brocante is tomorrow at 6 pm. Has it really been 6 months?? History of the Bird Cage! Barn House was a Blast! New Site, a Fresh Face! Vintage Roost Show in Full Swing! Gardening and Raising Chickens... OH MY! A New Journal Page...at last!! THIS IS NOT A JOKE! A New Year, a new blog!!!!! Where I create ~ a blog party!